Ajay Kumar Garg Engineering College (AKGEC), Ghaziabad is affiliated to Mahamaya Technical University and is approved by the All India Council for Technical Education. The college was established in 1998 and offers B.Tech Courses in Six disciplines of Engineering. The college also offers postgraduate course in Computer Applications (MCA) and M.Tech in Automation and Robotics, Electronics & Communication Engineering, Computer Science, Electrical Power & Energy Systems and VLSI Design. The college is certified for ISO 9001-2008 by BSI, UK. Placements: In the short span of a decade since its inception, AKGEC has established itself as an institution par excellence, dedicated to provide students with a strong scientific, technical and humanistic foundation and encourage them to develop creativity in defining problems and seeking solutions. What distinguishes AKGEC from other institutes is the unswerving commitment towards producing professionals of outstanding quality. To transform students into professionals and technocrats who will stand tall amongst the crowd, an effective T & P department has been established. TRAINING – With the mission to serve society by promoting excellence in education AKGEC aims to produce sound technical professionals with a temperament of strong logic. For this, special efforts are made to groom the students to meet the standards of the industry, both in technical knowledge and soft skills. There is continuous college-industry interface and interactive seminars on emerging technologies are arranged to provide wide ranging exposure to students. The college is part of the Campus Connect Program with Infosys for training students in accordance with the needs of the industry. The college also conducts specialized courses for CAD packages like PRO-E. The college also helps students in undergoing industrial training for 04-06 weeks (2nd year Mechanical & 3rd year all streams students) in reputed companies like BHEL, CMC Noida, Samsung Software, Genpect, HCL, NTPC Dadri, Miracle Technologies, Birla Soft, etc. Besides this, AKGEC strives to inculcate responsibility and accountability in its students; responsibilities towards their organizations and accountability towards the society. The college conducts Personality Development Program which enhances the soft skills of students, building up their self-confidence and motivating them to scale new unbound heights of glory. We imbibe in our students the values of self-discipline, decision making, cultural closeness & moral resurgence and above all we try to reap good citizens and ultimate human beings. PLACEMENT – A.K.G Engineering College believes that each student is a valuable resource. The placement cell concentrates on each student to his/her right career prospectus and assists him/her in achieving the same. The students are placed through the campus recruitment programs. The Training and Placement Cell is committed to fulfilling the dreams of all those who graduate from A.K.G.Engineering College. Objective of the placement cell is to place the students in good companies. This is achieved through campus selections conducted in the college for which the students are trained in aptitude, technical and soft skills, much ahead of campus selections.The Cell believes in overall development of the students’ personality, which will help them to achieve a rewarding career. 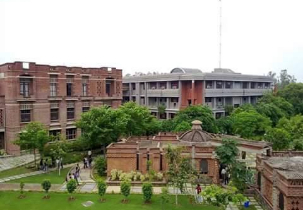 Campus: Ajay Kumar Garg Engineering College (AKGEC), Ghaziabad is affiliated to Mahamaya Technical University and is approved by the All India Council for Technical Education. The college was established in 1998 and offers B.Tech Courses in Six disciplines of Engineering. The college also offers postgraduate course in Computer Applications (MCA) and M.Tech in Automation and Robotics, Electronics & Communication Engineering, Computer Science, Electrical Power & Energy Systems and VLSI Design. The college is certified for ISO 9001-2008 by BSI, UK. The college has been consistently maintaining excellent academic results and placements. The college has the distinction of being the first and only college in UP to receive the Academic Excellence Award for the Best Engineering College in UPTU from H.E. the Governor of UP for two successive years. The college has the distinction of being the only Engineering College in the state of U.P. to have received approval from Department of Science and Technology (DST), Government of India, for establishment of Centre of Relevance and Excellence (CORE) in the field of Automation & Robotics. The program with an outlay of about Rs. 9.4 Cr envisages a unique partnership between AKGEC and seven international industries to promote research, consultancy, project development and training in the emerging technological field of Automation and Robotics. The college has also set up an Industrial Robotic Training Centre in Collaboration with Kuka Robotics of Germany. The centre provides internationally valid certification for its Basic, Advanced and Expert level training programmes in this emerging technological area. The college is also the first institution in UP to establish a virtual lab for remote experimentation in collaboration with IIT, Delhi. Hostel: The college provides well furnished hostel accommodation to its students. The five campus hostels are spread over three complexes namely, the Girls Hostel Complex, the Junior Boys Hostel Complex and the Senior Boys Hostel Complex. The two girls hostel have triple seater rooms and accommodate about 300 students. The Junior Boys Hostel having double occupancy rooms can accommodate about 300 students and is reserved for Ist year students. The Senior Boys Hostel Complex has two hostels with single and triple type accommodation and houses about 500 students. In addition, the two out-of-campus hostels accommodate about 120 Ist year girl students. College bus service is available from these hostels. Each hostel /complex has its separate mess with well equipped kitchens and dining area providing hygienic, nutritious and wholesome meals. Hostels have gymnasium as well as indoor and outdoor sports facilities. The hostels also have a TV room and library with magazines and fiction / general reading books. Hostels are also equipped with eco-friendly solar water heating systems. Hostels also have canteens and provision stores for minor item of daily requirement. The hostels thus provide reasonable levels of comfort, hygienic food, recreation facilities and an environment conducive for pursuit of academic and all round development.